This model is an illustration of Net Consultants (NCHK) Methodology which is a standard guideline for our employees to provide quality-assured services while ensuring dictated deliverables are generated. The ITSM model is a circle which means we devote continual care to the services to our clients even though after the implementation as we perform evaluations and analysis periodically. Through our four service areas, NCHK provides our clients with comprehensive and sophisticated solutions while our internal Continuous Improvement Programme controls the provided service quality in an agreed level. Our service areas include Service Strategy, Service Transition, Service Operation and Service Control while the major activities inside are IT Policy Management, Service Desk, Change Management, Incident Management, ITIM (Information Technology Infrastructure Management) , User Training, ISM (Information Security Management) and HSAM (Hardware and Software Asset Management). 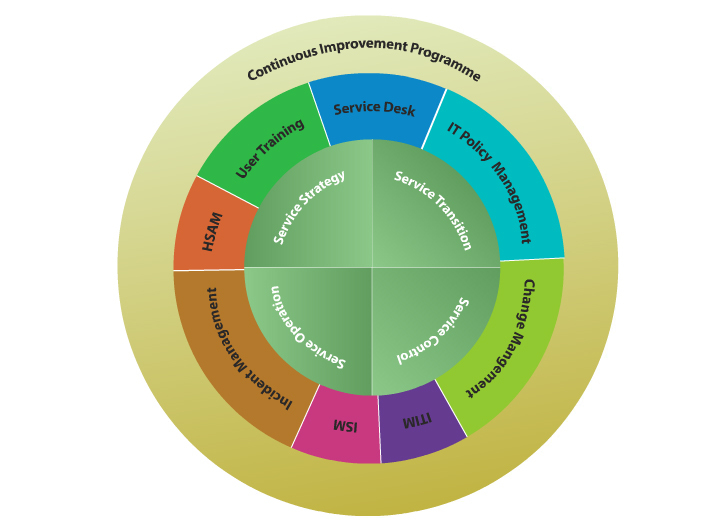 The internal Continuous Improvement Programme works silently in the background to ensure and improve the service quality.